Interested in joining VamoLá? Check out the information below to learn more about joining as a drummer, dancer, or volunteer. Get started by emailing info@vamola.org to introduce yourself, let us know what you’re interested in, and schedule a visit to one of our practices. If you’re a beginner, you’ll be invited to join group practices to get an inside look at how we work and an idea of the commitment involved. If you’re an experienced drummer, particularly with Brazilian or Latin percussion, you’ll progress more quickly. As you progress, you’ll be invited to perform when you’re ready. Dancers are required to know the basic samba step prior to joining practices. 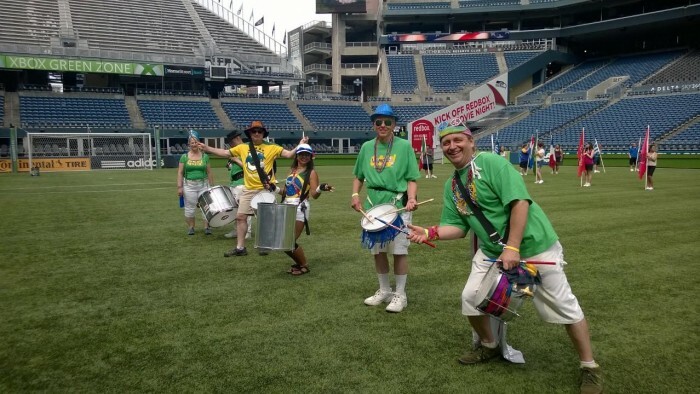 If you’re new to samba and would like to learn, contact info@vamola.org and we’ll help you find classes in the area. Once you have the basic samba step you’ll be invited to join practices. As you progress, you’ll be invited to perform when you’re ready. I don’t drum or dance, but I want to get involved! For summer parades and other events, we look for volunteers who’d enjoy parading and helping as water carriers and more. Instant celebrity! Contact info@vamola.org for more information.